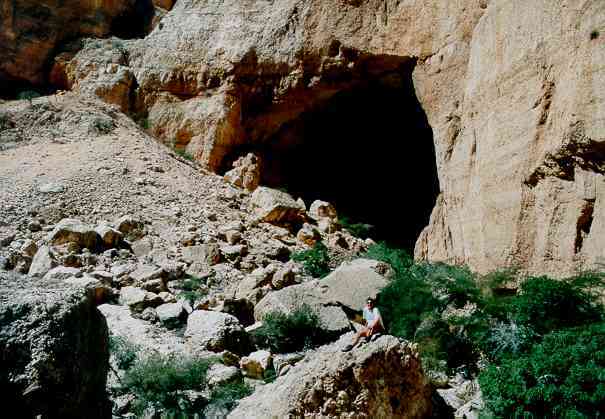 2 days ago I walked along a deep canyon in the mountains in Oman and spent the night in a pristine huge cave. Last night I slept on the plane in a business class seat and tonight I did some step-aerobics in a posh fitness club. The contrast can’t be larger, from a 1001 nights Aladdin’s cave in the mountains of Oman to the western substitute of physical exercise inside. The trek below is an overnight trip, a 3-4 hour walk along a canyon, spending the night in a huge cave, and 2.5 hours back. The trail along the canyon is reasonably marked and there are no treacherous portions but you will need time finding the trail as the local goats create numerous side trails. 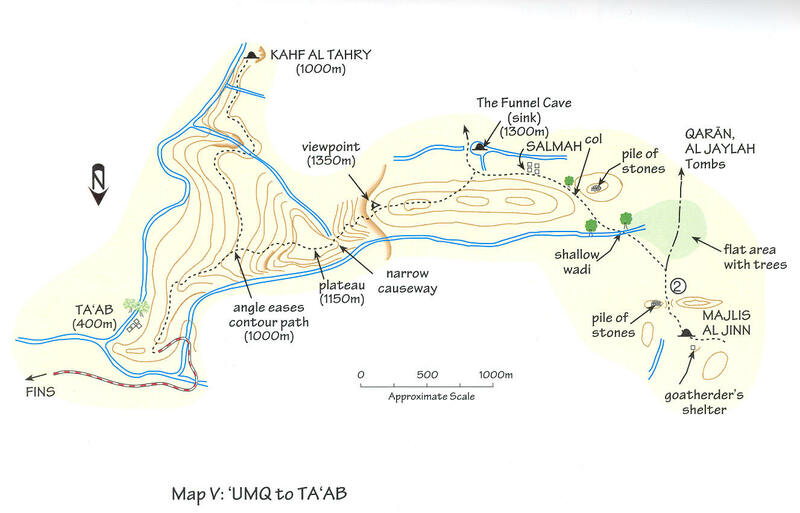 Map of the area showing the trail to the Kahf Al Tahry cave. 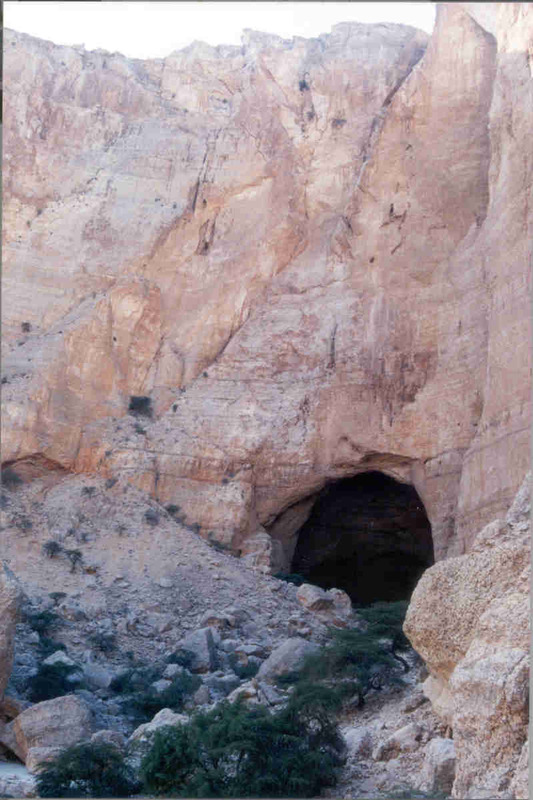 The second largest cave in the world, the Majlis Al Jinn, is also indicated. From Dale and Hadwin. 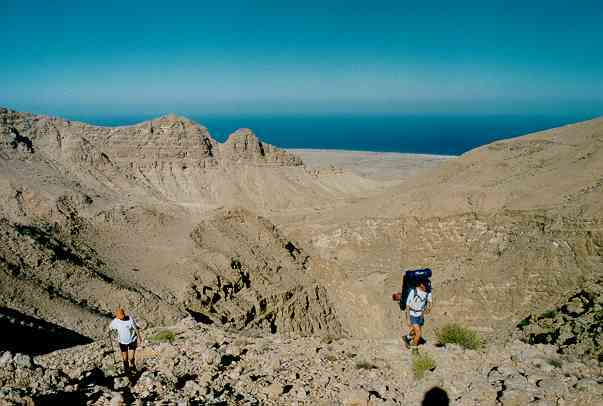 Adventure Trekking in Oman. 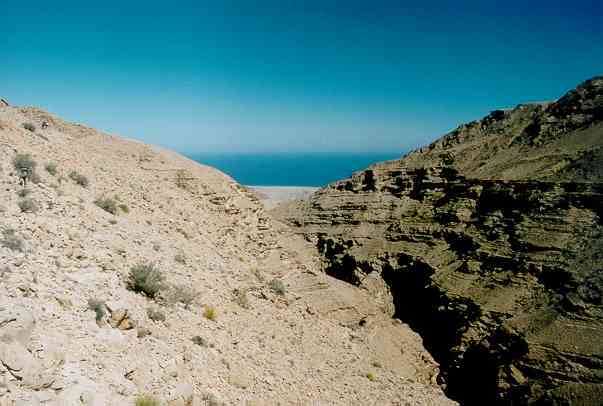 The trek starts near the small coastal village of Fins, an over 2 hours drive South-East of Muscat. First you drive for an hour on a tarmac road and this changes to a dirt road for at least another hour. In February 2002 a tarmac road was being built that will be extended to Sur. In Fins you can see a dirt road winding up into the mountains. Just past Fins you turn to the right, go through a few houses, keeping right (the left road is a dead end to a garbage dump) and hopefully you are on the right track to the mountain road which first heads left of the winding visible part in the distance. If you don’t have a four-wheel drive car you better leave the car at the base of the steep road and walk the last 3-4 km. 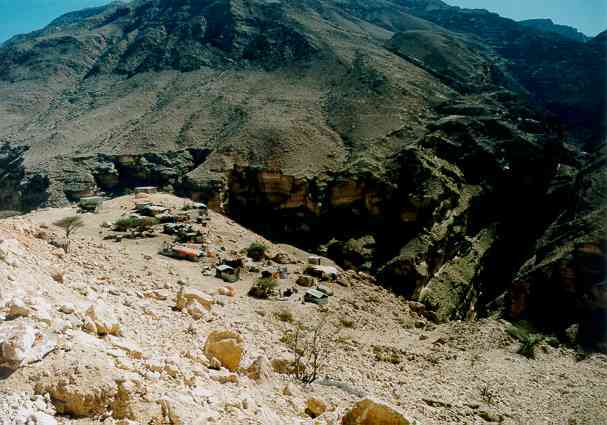 Once you pass a goat and donkey camp  to your left you are already in the canyon and after another km the road widens and ends as the steep part going down to a wadi is washed out. This is roughly 11 km from Fins and at GPS location 0720100 2533200. Here you can turn the car easily. Do not drive down this part of the road as it is rocky and steep. You may not manage to go back up again. Start walking, in early February the midday temperature was around 27 degrees Celsius. Go down to the wadi and up again to the pass where you can see the palm trees of the hamlet of Ta’ab and this has only a few houses. At the pass follow the trail winding along the main ridge by carefully watching the rock cairns. Here the goats have created numerous side trails and you may have to back track a few times to find the proper trail. 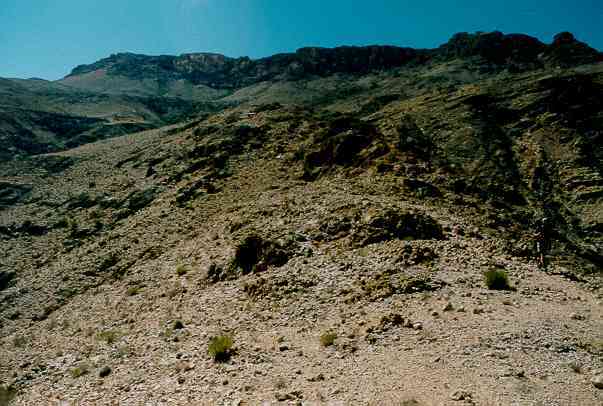 The trail is first on the right side and near the top of the ridge for a few hundred meters and then veers of to the left for 300-400 m staying some 30-40 meters below the ridge. It suddenly cuts up steeply back to the ridge and this is not easily visible but I made a few more rock cairns to mark it. Here it is again on the right side for 300-400 m nearly on top of the ridge. So far the ridge was reasonably level but now there is a split in the trail, one cutting up to the right and not so well marked and one to the left staying level and very well marked with cairns. 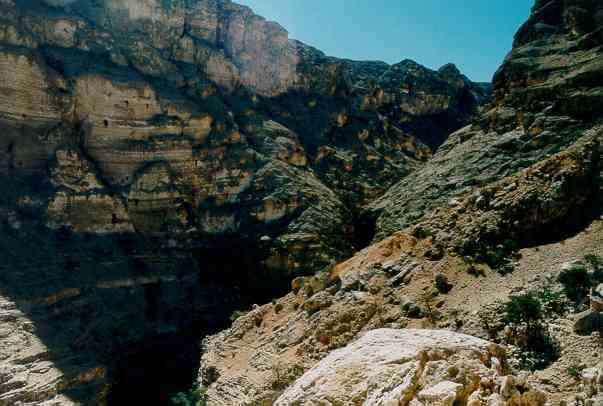 Follow the left trail  and after 200-300 meter you see steep rock walls and can now pass the wadi. Here the GPS location is 0719750 2531808. Canyon, looking towards the sea. Path follows middle-left ridge. 4WD trail visible in the far distance below the far ridge. Don’t take the one on the right as I did, but simply aim straight ahead for the cairn clearly visibly higher up the ridge. Roughly 50 meter higher you are now on a plateau. 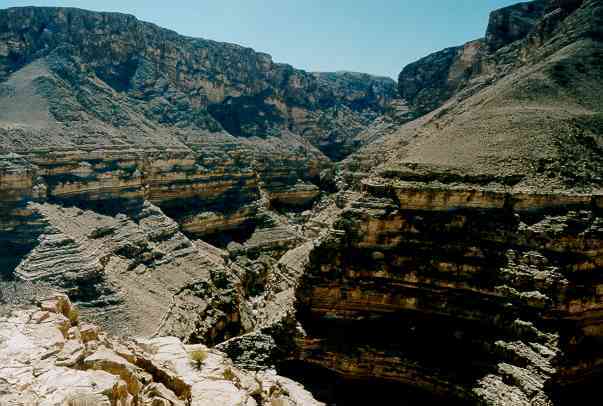 Follow the trail across the plateau and after a kilometer you are on the side of the canyon with panoramic views . From now on the path will roughly follow the contour lines of the canyon. 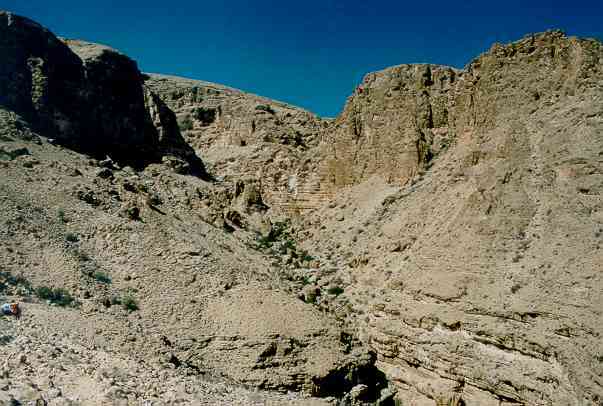 Here there is a big side canyon  you will need to cross. 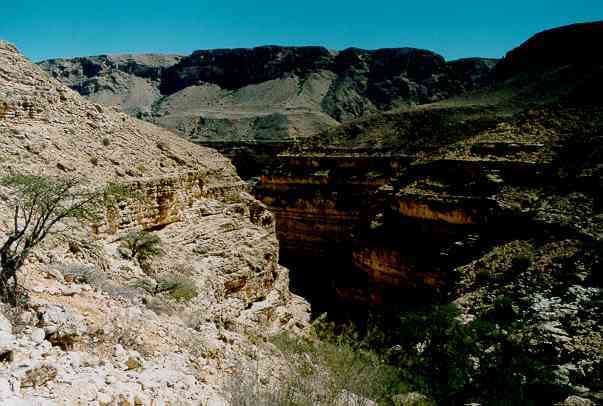 Split of canyon, roughy 300-400 m deep, view to the SW. Path visible top right. Cave is 1 km SW.
Just follow the trail for roughly 500-700 meters and you will be able to cross it at a spot with big boulders  where I saw wild donkeys. Now we are roughly 1 km from the cave. 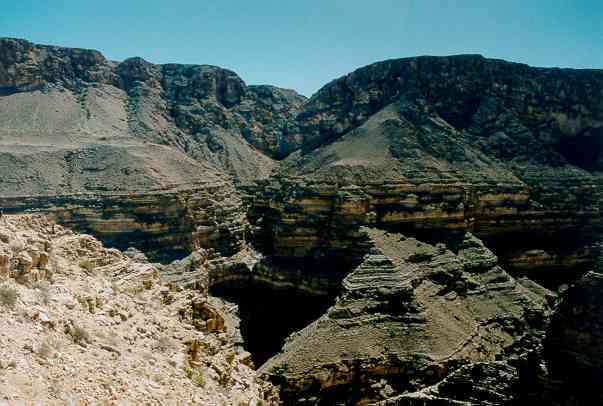 Keep going on the path along the steep canyon  and you will see the cave in the second side valley  at GPS location 0719200 2530000. The cave is clearly visible from a distance of 500 meters as a big hole 20-30m across in a roughly 200 meter high rock face  and after crossing several boulders you will be able to enter. 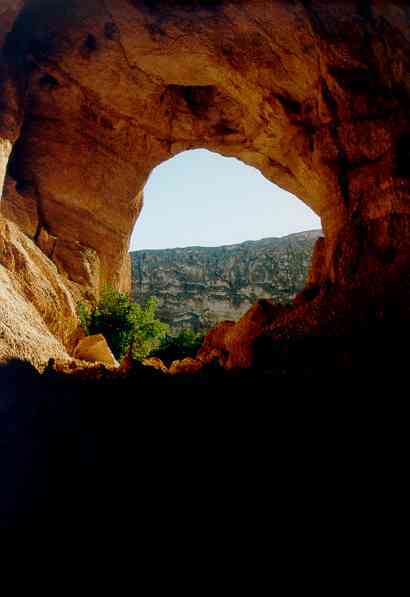 View at the Kahf Al Tahry cave entrance. Wall is roughly 200 meters high and cave entrance about 30 m high and 20 m wide. 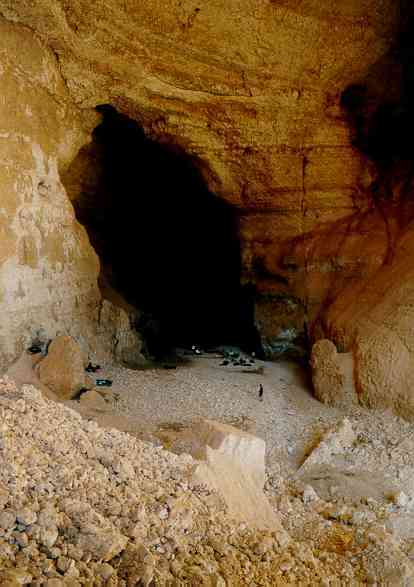 Inside the cave is roughly 20 meters wide, 30-40 meters high and the flat part is about 200 meters long with nice gravel and sandy part for camping . There is no water except for a few puddles with stagnant water further inside. Swimming and drinking the water is not recommended. We made a fire inside the cave but dead wood is already sparse and you better not use the remaining bits and pieces. Dead wood is vital for insects to live and breed. The sleeping is very comfortable on the level gravel and sand bars and the temperature at night was around 20-21 degrees Celsius. There were no mosquitoes or other biting insects at night. The cave is part of a tunnel system of roughly 16 km and there is a passable route of about 2 km starting from the other side, see The Funnel Cave sink on the map. We walked inside the cave starting at the end (down stream) and knew we would be stopped halfway. We crossed numerous big boulders and the walking is not easy but never treacherous involving climbing over or crawling underneath 2-3 meter high boulders. One fixed iron rope ladder helped us to cross a 4 m high wall. After roughly 45 minutes and 1 km we came to a vertical wall with a hanging static rope. Here we stopped. Normally you should come from the other side and its seems that you need 200 m static rope to make it through the in total 2 km tunnel system starting at the ‘The Funnel cave". Walking back to the entrance took us 25 minutes. 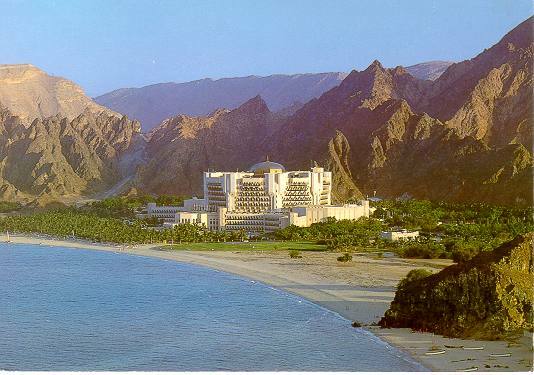 We started walking around 11 AM and there was the temperature was a comfortable (for Oman) 27 degrees Celsius. Most pictures below were taken in the morning with the midday sun shining in the canyon. It took us an easy 2.5 hours to walk back to the road, now with a much lighter packsack as most of the food and water (some 3 liters per person) were gone. On the last ridge down, roughly the last 500 m to the road, the goat trails fooled us again and we had to climb back to the last ridge. On the way back to Oman, roughly 10-15 minutes from Fins, we stopped at a public beach. Two donkeys approached us but were very shy in taking the remaining food offered. The male donkey took most of it pushing away the female but she tried to hit him with her back feet, typical donkey style, and a finally got a few bits and pieces. This was a fantastic trek. A combination of rugged mountains, a very comfortable, overnight address, pristine wilderness and a cave trip. Goat herders camp near the end of the 4WD trail. Canyon, looking towards the sea. 4WD trail visible. 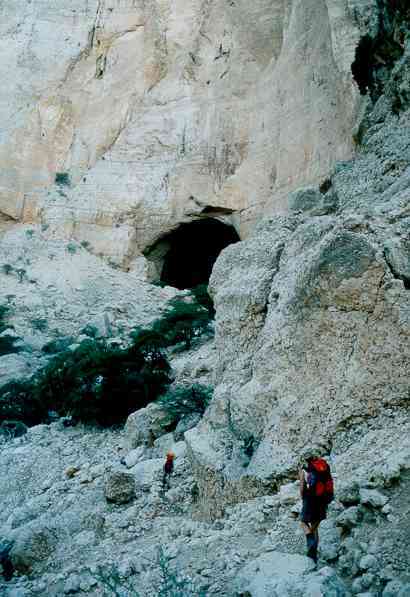 Canyon trail, split of trail, left trail reaches the plateau soon, person on the right, view to the SW.
Cave entrance, note trees for scale. Rock face is 200 m. Photograph by Dave Brindle. Cave entrance nearby, note person for scale. Cave inside, light by the morning sun. Cave passable for another km. Coast south of Muscat. Photograph by Paul Taylor. City of Rumi near Muscat. Note contrast with barren mountains. Photograph by Paul Taylor.